I agree. Great to see Shepard on the cover but Elbow Toe, Gaia, Clown Soldier, Swoon, or Faile would have been great. And they would have launched a street artist into FAME. 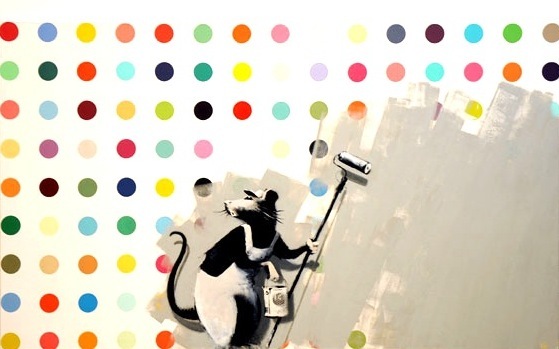 I love Banksy's comment on Hirst's poka dot "paintings." They remind me of a skirt I wore as a teenager and it was retro (not in a stylish sense) even then. As for the cover - I would have loved to have seen some of the great "amateur" photos that I'd seen on FB or various blogs used as the cover. Usually taken by those who are part of the movement, they convey passion and commitment. I'm sending you an image by a street artist I found in Soho (on the street of course) last year. The problem with Fairey is not his images... it is his attitude. If you know him well enough to name his fave alki drink (Yes, I know it) you know that he does not believe in half of what he projects. It is all an 'image' to play on the youth market. I worked alongside his crew for three years and have known him for a decade. Tell all book coming soon. Fair warning. The banksy versions are so much MORE than the originals, not a show I would go out for. Hope you had a marvellous holiday! I would have oved a cover by Swoon too.